In my opinion, nothing’s cooler than the original Legend of Zelda! From dungeon level 1 Eagle to level 9 Skull all the way to the second quest, I never got tired of playing this game over and over again. As a kid, I spent hours looking through the strategy guides and instruction booklets that came with the game. I love the original artwork of all the characters like Aquamentus, Darknut, Digdogger, the Eyes, Ghoma, Gibdo, Lanmola, Dodongo, manhandla etc. I remember thinking that the art in the booklets is so cool, but they don’t represent the same on screen in the actual game. I would tell myself – “I can’t wait until games have better graphics to properly portray the art in all the books” (and look where we are now!). With that said, here is the first graphic t-shirt design from my, soon to be, Legend of Zelda series. 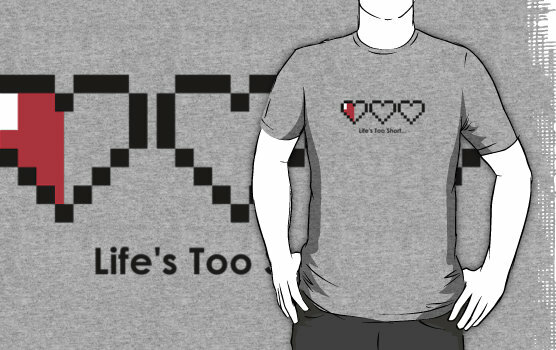 Yep, it’s the life heart graphics with the popular phrase – “Life’s Too Short”.